George was born about 1835 in Providence, Providence County, Rhode Island. His profession was a lawyer. On 30 November 1862 he joined Company F, 51st Regiment of the Illinois Infantry as a 1st Lieutenant, later promoted to 2nd Lieutenant and Captain. He was injured during the Battle at Spring Hill on 29 November 1864 in Spring Hill, Tennessee. He was disability discharged on 15 May 1865. George started drawing his Civil War Pension on 19 May 1884. He died on 13 September 1884 and is buried in the Hawley Cemetery. Burial, Tombstone Photo. There is an extensive biography of George at this website. Burgess was born 17 June 1841 in Virginia. He enlisted as a Private on 14 August 1862 in Company C, 90th Ohio Regiment. He was promoted to Full Corporal 28 September 1862 and 1st Sergeant 1 June 1865. He was discharged 13 June 1865 at Camp Harber, Tennessee. In the 1890 Veterans Schedule he is living in Glyndon. In August he started drawing his pension on 6 August 1904 and dies 13 December 1904 in Ohio. Burgess is buried in Ohio. Burial, More Bio Information. Extensive Biography on Gilman (Click through index for his name). It does not include (April 2015) his death on 23 December 1923 in Williams County North Dakota but his residence is noted as being in McKenzie County, North Dakota. Almond was born 18 June 1844. He enlisted from Appleton, Wisconsin into Company E 40th Wisconsin Inventory as a Sergeant. He mustered out on 16 September 1864 in Milwaukee, Wisconsin. In the 1890 Veterans Schedule he is living in Moorhead. There is a biography of him posted on his Find A Grave Memorial. He died on 14 August 1930 in France and is buried there. Burial, Portrait, Bio Information. Antone was born in February 1836 in Norway. He enlisted in the U. S. Navy on 7 February 1865 in Philadelphia, Pennsylvania and was a Fireman 1st Class. He was mustered out on 12 February 1867 in Washington, D. C. Antone lived in Barnsville in 1890 and 1900. He died on 6 April 1915 at the Wisconsin National Home for Disabled Volunteer Soldiers in Milwaukee and is buried there in Wood National Cemetery. Burial, Tombstone Picture. Alonzo was born 29 September 1834 in Skonig, Sweden and died in Moorhead on 8 December 1932. At this site there is an extensive biography on Alonza along with a portrait. James was born in 1843 in Maine. He enlisted as a Private on 16 October in Company D, 1st Minnesota Mounted Rangers. He was discharged 4 November 1863. 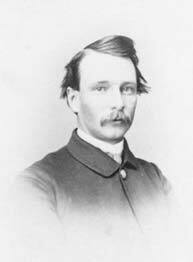 On 2 March 1876 he was appointed Postmaster General for Georgetown. In the 1880 Federal Census and the 1890 Veterans Schedule he is living in Georgetown. His wife is Ida, a daughter Emily and two sons Gowan and James. James died on 11 June 1891 and is buried in Wild Rose Cemetery in Georgetown. Burial, Tombstone Picture. Wellington was born 10 May 1845 in Canada. He enlisted as a Private in Company E, 116th New York Infantry on 12 August 1862 from Buffalo, New York. He was discharged on 5 September 1862. In 1890 he was living in Georgetown and in 1895 and 1905 he was living in Moorhead. He died on 29 June 1929 in Beltrami County and is buried in the Greenwood Cemetery in Bemidji. Burial, Tombstone Picture. Casper was born about 1842. He enlisted as a Blacksmith on 21 October 1863 in Company L 2nd Wisconsin Cavalry and mustered out on 15 Novemer 1865 at Austin, Texas. Casper started receiving his pension on 13 August 1890. He died on 19 January 1934 and is buried in Barnesville. Burial, Tombstone Picture. William was born about 1846 in Connecticut. He enlisted into the Civil War in May of 1861 and remained until the end of the war when he was a Captain. The Minnesota Grand Army of the Republic recorded him as living in Barnesville. In 1905 he is living in Barnesville as a minister. Warren's death record and tombstone shows his first name as Warren but earlier records show it as Wanen. Warren was born 22 Jul 1847. He enlisted on 22 May 1863 in New York as a Private in Company K 4th New York Heavy Artillary Regiment. He was discharged 26 September 1865. In the 1880 Federal Census he is in Glyndon and in the 1890 Veterans Schedule he is in Goose Prairie. In 1900 census he is in Hawley. He started drawing his pension on 1 April 1884 in Minnesota and his wife Della started receiving a widows pension 4 August 1920 in Washington. Warren died on 6 July 1920 in Washington and is buried in Tracyton Cemetery in Bremerton Washington. Burial, Tombstone Picture. The following is from History of Clay and Norman Counties, Minnesota, Volume II - Biographies (1918) in a biography of his brother Wright: ".... Warren, who came to Clay county among the early pioneers in 1873, took up a homestead in section 20, Cromwell township, which he later sold and bought a farm in Hawley township, operating the same until 1907, when he sold out and moved to the state of Washington, where he now resides...."
WRIGHT WORKS In addition to the extensive biography linked below: John enlisted at Ogdensburgh, New York on 24 September 1861 as a Private in Company B, New York 60th Infantry Regiment and released on 18 December 1863. Wright was named postmaster Muskoda on 23 December 1905. He started receiving his pension on 30 December 1864 and his wife, Maude, started receiving a widow's pension on 3 July 1926. Wright died on 9 October 1925 in Hawley and is buried at Hawley Cemetery. Biography from History of Clay and Norman Counties, Minnesota, Volume II - Biographies (1918).